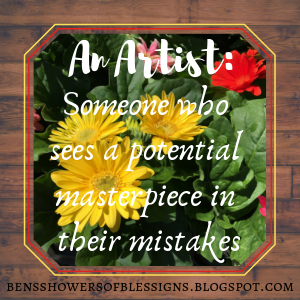 Showers of Blessings: Week #1: GIVEAWAY // FIRST DEVOTIONAL // ONE YEAR OF BLOGGING! Week #1: GIVEAWAY // FIRST DEVOTIONAL // ONE YEAR OF BLOGGING! Today calls for a tremendous amount of confetti and chocolate! Showers of Blessings is exactly one year old this month. (February 28 to be exact!) Twelve months ago, I started this little blog, and it has become a very big part of my life. I have grown so much since first starting Showers of Blessings. This small spot on the internet has impacted me more than I could have ever imagined! God truly has orchestrated my blogging journey. First starting out, I had pretty much no idea how to blog. And after a whole year, I have only just scratched the surface. Blogging and writing in general is really a art that takes continuous learning! And I am so glad that God has given me the opportunity to write for Him! Because blogging has been such a wonderful experience, I have decided to take this month of February to celebrate Showers of Blessings birthday! And it wouldn't be a blog "party" without GIVEAWAYS and a some other FUN posts, so I am going to do something I have never done and each Wednesday in this month, I will post something that is going to be crazy fun! The giveaways are something that I have been planning for a very long time (like, three months!) Along with some other ideas such as a Q&A (but that comes later)!!! Soooo, here's how the giveaway's will work! 1. How did you first find Showers of Blessings? 2. What is your favorite post that you've read on Showers of Blessings? 3. What do you like the most about Showers of Blessings? I will be drawing out of a hat for the winner of the prize! Ok, ok, now can we PLEASE see what we are entering for a chance to win you ask?? Oh, yes, of course! But, you will have to scroll!!! 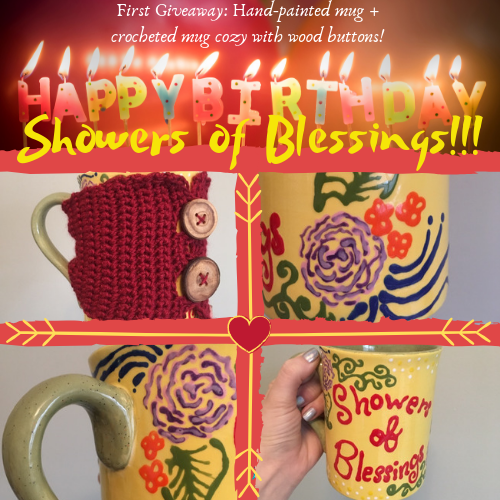 A hand-painted Showers of Blessings mug + a handmade crocheted mug cozy with handmade wood buttons! I can't wait to see who wins this first giveaway! 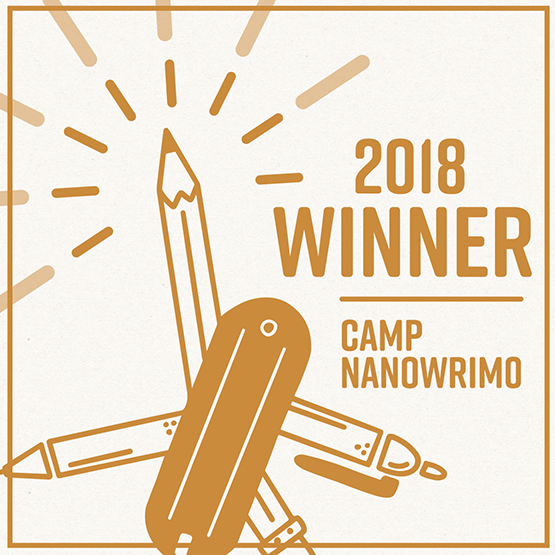 Along with the giveaway's this month, I would also like to share with y'all some of my first beginnings when it comes to writing. Today I will share my very first devotional ever written, next week I will share my very first poems, and so on. "Of all the things God can bring to my attention... He chose a spider. You see, I was mad, confused, and overwhelmed all at one time. I couldn't talk to anyone about my feelings because they were so hard to explain. They were too complex. So, I tried to sort things out myself by sitting in the shower. I was frustrated by the way I felt, I just wanted to be HAPPY. As you might have guessed, it was Friday night-- the beginning of Sabbath. Satan works overtime on the Sabbath, trying to ruin God's day. Well, he was working really hard! I tried to stand up to Satan. I tried not to let him get under my skin. But no, I couldn't do it by myself. Satan made me feel like I was nothing, worthless. He made me think that I couldn't do anything right. Bad things about myself was like a thick fog pressing around me, blinding me of the good things. The burden of self-pity was heavy on my shoulders. I wanted to be Joyful, Happy, Content. I knew that only God can give me true happiness, by filling me with His joy and love. The only way to be truly content is to let go. Let go, and let God. So, as the tug-of-war with Satan and God raged in my head, I looked up... And on the wall of the shower, I saw a spider. Now, most people would not care for the idea of taking a shower with a tiny, but very long-legged spider. But, instead of killing the spider, or flicking it out of the shower, I watched it. I watched it walk from close to the top of the shower wall and down. It was going at a fairly good speed like it was confident to where he was heading. As he descended the water-splashed wall, every few steps he would stop and fold one of his legs underneath him to where his body was. To me, it was like he was taking a drink from the water on the wall, or maybe he got stuck in the water and was wiping it off. But whatever he stopped at the water for, he only stopped for a moment then moved on. He kept going down the wall and I thought he might keep going to the floor and drown or something. I was wondering if he knew there was danger and that going down was a bad idea, because about a foot from the floor, he stopped. He paused awhile, then started to climb back upward. Going up was a lot harder than going down for the little spider. He would loose his grip on the wall and fall, but every time he fell, his web string would catch him. The spider would swing in the air for a second, then regain a lower spot on the wall. He climbed up and then would fall again and again. The only thing saving this spider his string attached to one of is long legs. Water droplets slid down the wall and gravity was against him, but he never gave up on his hike. Now, as I watched the little spider on his journey in my shower, God won the tug-of-war with Satan. God sent me that spider as a object lesson. You see, I am the spider. My journey in life is the shower wall. As I walk my journey, there are obstacles or situations, these are the water droplets on the wall. I can choose how to react to the obstacles, either for the good or for the bad. Just like the spider either took a drink of water or got stuck, we can choose to learn from our problems or just get stuck and let them slow us down. In our life, we might find that we have taken the wrong path or made a bad choice so we decide to turn around, like the spider did when he got close to the water. This is when Satan really tries to get you. Satan pulls you down with force like gravity, all the while throwing water droplets in your face. You lose your grip, you slip and fall, but you are at peace with it because your string always catches you. Do you see the picture? God is our safety string. He is always with us everywhere we go. When we fall and make mistakes, he catches us until we gain our footing. God gives us each one of us a web string of Love and sometimes that is the only thing to hang on too. We will always have God's help. Nothing and no one can take it away. Satan is always going to try to make us give up and be discouraged, but lets take our little spider friends advice and keep climbing upward!" A grand total of 821 words made up my first devotional that I wrote it as soon as I got out of the shower. After that day, I started looking for other object lessons and the rest... well, they say, is history! That is how I first began writing devotionals! Fun fact: Another devotional I wrote early on was Quicksand. Are you going to answer the three questions to get entered for the giveaway prize? Are you as excited as I am for this month and the fun posts? 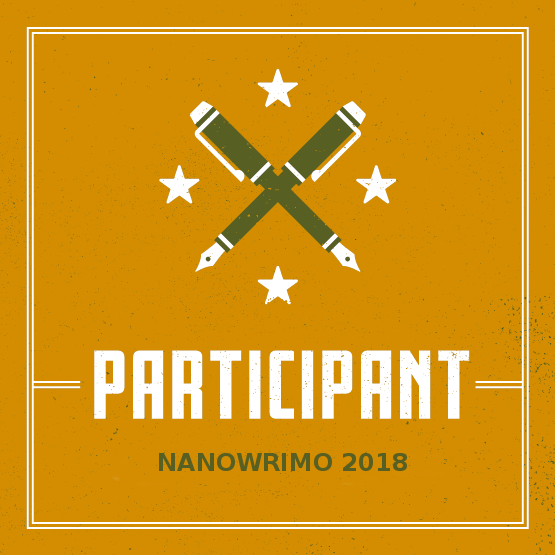 Have you ever shared any of your first drafts and first writing works with anyone? *cues nervous gulp* Did you read my first EVER devotional? 2.MY favorite posts are monthly wrap up posts. 3.I love your poems, and stories. I'm glad to hear you like my wrap up posts! ;) You have 3 entries! This giveaway looks so cool!!! 1. I found this blog like I find a lot of blogs. I look at blogs my friends follow if it sounds like a good blog I check it out. 2. I like to read all of your post!! I think this one is a favorite! 3. I like the colors and stories, learning more about you! The devotional was so good!! *throws confetti* I have alway's wanted to host a giveaway! They are a lot of fun! Thanks! I'm glad to be able to share some of my first writings with y'all! The cup is so pretty! I'm not sure how I found your blog, but it may have been when someone tagged you. It may have been Alice Seavey, but I'm not sure. don't know my favorite post, but I do love your poems. What I like most about Showers of Blessings... hmm. Well, you! You have 3 names in the hat!!! Wow! This is exiting! Happy One Year Anniversary!! 1. How did you first find Showers of Blessings? umm.... I think you followed me so I followed you back. umm.. Probably this one! :P I love giveaways! Probably the rustic look of your blog! You have 3 entries, Beth! Yay for you, Brooklyne! *applauds and throws confetti* Since I, too, am a blogger, I'm awed that you have posted EVERY WEDNESDAY, for a FULL YEAR!!! Yippee! *throws more confetti* Good for you! And a BIG round of applause for Showers of Blessings' first birthday! That's so exciting! What a beautiful devotional, too! Very touching. As for being young when you wrote it, "Let no one despise you for your youth, but set the believers an example in speech, in conduct, in love, in faith, in purity." (1 Timothy 4:12) Thank you so very much for sharing! And now you're hosting a giveaway? *big grin* Sounds super fun! Count me in ;-). (2). What is my favorite post? 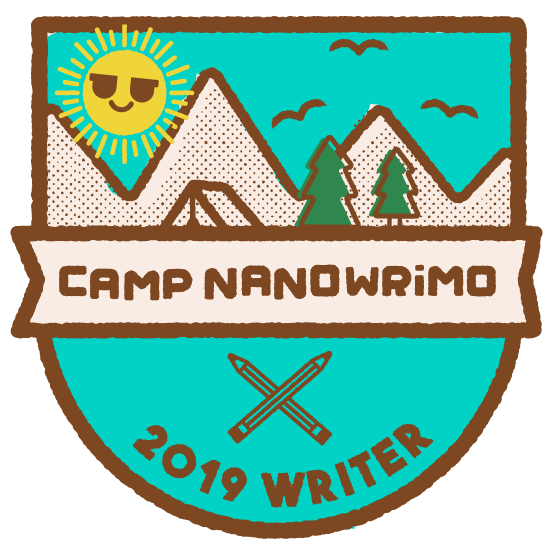 Since I'm still exploring your beautiful blog, I'll have to say that ONE of my favorite posts is either this post or one of the wrap-ups :-). Your pictures are always so fun! (3). What do I like most about Showers of Blessings? The warm, cheerful young lady that's "behind the screen" :-) I also (again) LOVE your pictures! You have 3 names in the giveaway hat! I'm so glad you like the pictures and wrap up posts! Oh, that's so sweet of you to say! Your comment brightened my day! Thank you, Ellen! Thank you, Mallory!!! I'm glad you liked reading my very first devotion I wrote! happy one year posting into the blogosphere! 1. I’m not exactly sure. I think it may have been that you left a comment on my blog and that’s how I found your blog or it may have been through the Circle C blog. 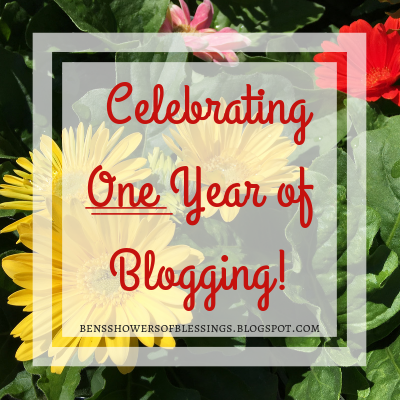 Congrats on one year of consistent blogging!!! 2. Hmm... Well, I really enjoyed reading the January wrap up post! Yay! You are entered 3 times! Yes, you were one of the first three bloggers I contacted about starting a blog! You have 3 giveaway entries!!! Hooray, hooray!!! *throws confetti and dances in a circle* Conragts, Brooklyne!!!!!!!!!!!!!!!!!!!!! YAY!!! YIPPEE!! 3. and what I love most about Showers of Blessings? Probably you! I've loved getting to know you through this amazing blog you've created into a warm, cheery, happy corner. You really are a blessing! You have 3 giveaway entries! I just put your names in my cowboy hat sitting next to my bed! I'm so glad you liked reading my devotional, Izzy!!! Oh, I'm so thankful that you find encouragement through Showers of Blessings! Aw thanks, Molly, and back at ya! You have 3 entires for the giveaway prize!!! The mud run's were so much fun! I'm so glad you liked reading about our adventures! Oops I'm just catching up. What an awesome post! I am exciting for the others. I loved your devotion the message really spoke to me. Also I remember a so similar experience being in the shower with a sleepy fly in winter. Haha, is that weird? Congratulations on 1 year and posting right through! Your a hero.